La Paz, Bolivia’s famous gondola system celebrates its second anniversary in May as a successful, low-cost travel option that moves 100,000 people per day. It’s also setting a global standard for a type of transportation that should be way more popular. The gondola system serving the citizens of Bolivia’s capital city is called Mi Teleférico (“My Cable Car”), and it’s Guinness-certified as the longest system of its kind in the world. 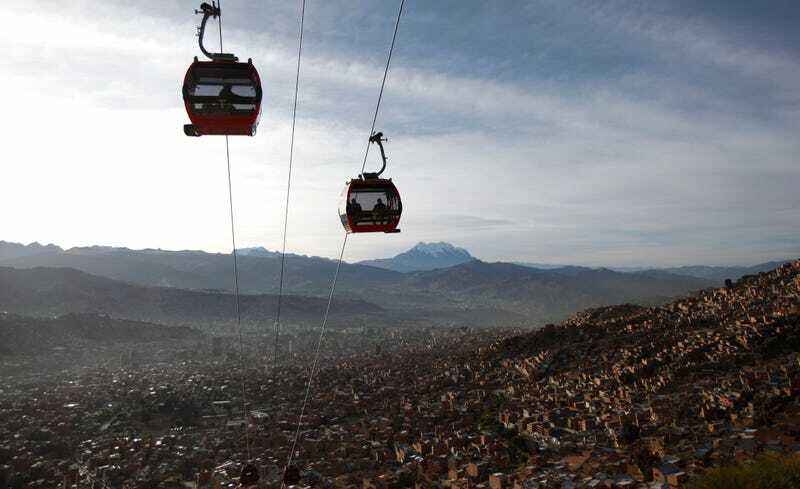 Rising nearly 1,000 feet in the air, the gondola is a quiet, safe, green alternative to the loud, crowded, polluted road route that connects La Paz and the nearby city of El Alto. Plus it looks fun as hell. Right now, the government-bankrolled gondola network covers 6.2 miles, has 10 stations, and runs cars that arrive every 12 seconds. The fare is three bolivianos, or $0.40, and includes free wifi powered by solar panels on each car. It operates 17 hours a day, and not only helps locals get around, but it’s emerged as a huge tourist attraction. The Guardian recently interviewed La Paz locals who rave about the gondola system: “The views are great and it’s really fast,” one says. Can’t say the same when you’re sitting in the back of a bumpy bus staring out the window watching the KFCs roll by! Twenty months later Mi Teleférico has been deemed a success: The three existing lines have reduced congestion and brought in big bucks—in the first 60 days, it made $1.2 million. The city’s already working with the Austrian cable car company Doppelmayr to build six more lines that’ll add over 14 miles and 23 more stations to the existing network. It’s tricky to build gondolas everywhere, though, as they’re ideally fit for certain conditions: “Ninety-nine percent of our cable cars are built in high mountainous areas with large slopes, landslide and glacial areas that are equal to or more complex than La Paz,” Javier Telleria, general manager of Doppelmayr, told The Guardian. But they’re still faster to build than light-rail and much cheaper than subways: La Paz’s chair lift cost $234 million, and New York’s Second Avenue subway costs a whopping $4.5 billion—and that’s just the first 1.5-mile segment! While not many American cities are keen on gondolas, there is a proposed plan to build a similar cable car in New York. It’s called the East River Skyway, but getting it actually constructed requires substantial regulatory maneuvering, and obviously lots of money. Manhattan does have a tram that connects Manhattan to Roosevelt Island, so maybe that one tram will make getting another easier. Let’s hope so: Gondolas like Mi Teleférico could—and should—be the efficient, budget-friendly transit solution of the future.